The following commentary has been adapted and expanded from remarks posted to an online Austin rail discussion. Lyndon Henry is a transportation planning consultant, a technical consultant to the Light Rail Now Project, an online columnist for Railway Age magazine, and a contributing editor to Austin Rail Now. He is also a member of the Light Rail Technical Forum and Streetcar Subcommittee of the American Public Transportation Association (APTA). His comments highlight the vision of Austin Rail Now and other transit advocates that light rail is justified in, and needs to be planned for, a number of the Austin area’s major travel corridors. As most Austinites are undoubtedly aware, the Drag is that section of Guadalupe St. stretching between (approximately) West MLK Jr. Blvd. and W. 27th St. Straddled by the University of Texas campus on its east side and the high-density West Campus neighborhood on its west side, the Drag is perhaps the single most important segment of the Guadalupe-Lamar corridor. See: «Long saga of Guadalupe-Lamar light rail planning told in maps» and «Dobbs: Density, travel corridor density, and implications for Guadalupe-Lamar urban rail». 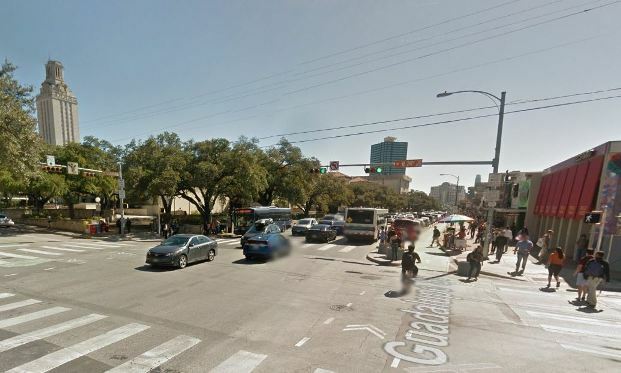 Last month (August 2015), AURA (originally Austinites for Urban Rail Action), a grouping of mostly Millennial-aged urban planning enthusiasts, posted a proposal for major improvements on the Drag, one of which suggested: “Extend transit priority lanes from Downtown to the Drag”. At peak periods, transit moves roughly half of the people passing through the corridor. This is to be expected in a central location like the Drag, as transit is by far the most efficient way to move people in a city. Given the anticipated growth of the city, increasing the throughput of people in the corridor is of paramount importance. 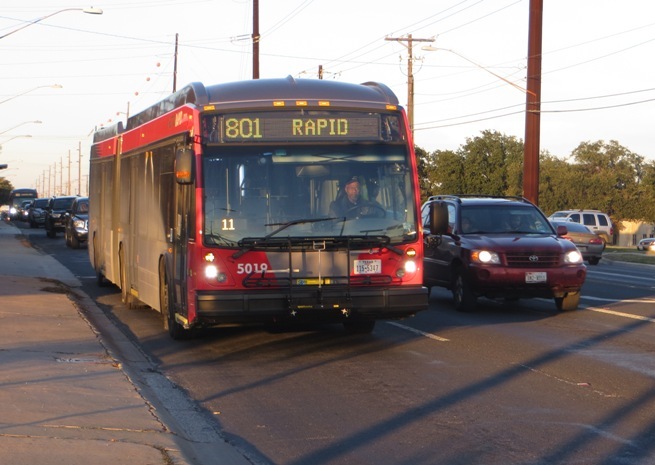 The city should plan ahead for increased frequency of existing bus routes, and continue to examine the viability of Guadalupe as a future corridor for rail service. Buses should not have their effectiveness limited by less efficient forms of mobility. Two lanes of Guadalupe should be dedicated solely to transit. 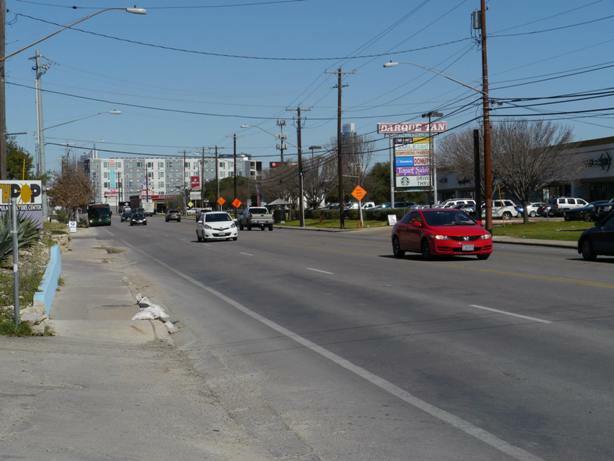 Back in May, per its contract with the City of Austin (COA), UT’s Center for Transportation Research (CTR) produced for city staff a memo of its findings with respect to installing dedicated lanes on the Drag. 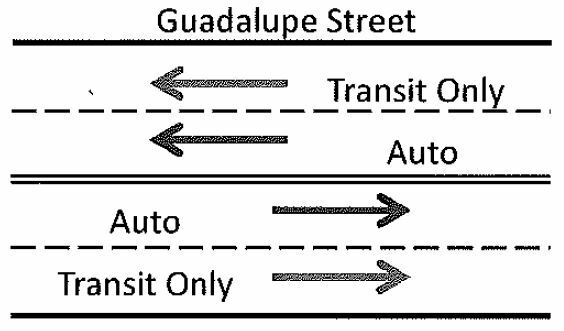 As summarized by AURA’s John Laycock, the report “modeled three scenarios: Scenario 0) the baseline scenario, Scenario 1) a transit lane in each direction on Guadalupe, and Scenario 2) diverting the buses completely off of Guadalupe onto San Antonio.” Laycock reports that the city subsequently requested CTR to model an additional case, involving one transit lane northbound on Guadalupe and another southbound on Nueces/San Antonio. Results from that additional modeling effort apparently have not yet been released publicly. First, I’ll note that implementing a high-quality bus service as a precursor to rail can be an effective way of building ridership and preparing the public for the coming rail upgrade. Likewise, establishing reserved transit lanes that can be dedicated to rail can also be helpful. However, both infrastructure and configuration of dedicated transit lanes, done improperly, can create problems. • Infrastructure — Proponents of dedicated transit lanes have argued that all that’s needed is to paint some stripes on the street. And certainly, in the scheme of transit capital projects, just “painting” markings on pavement is relatively cheap. But there’s almost always more involved. 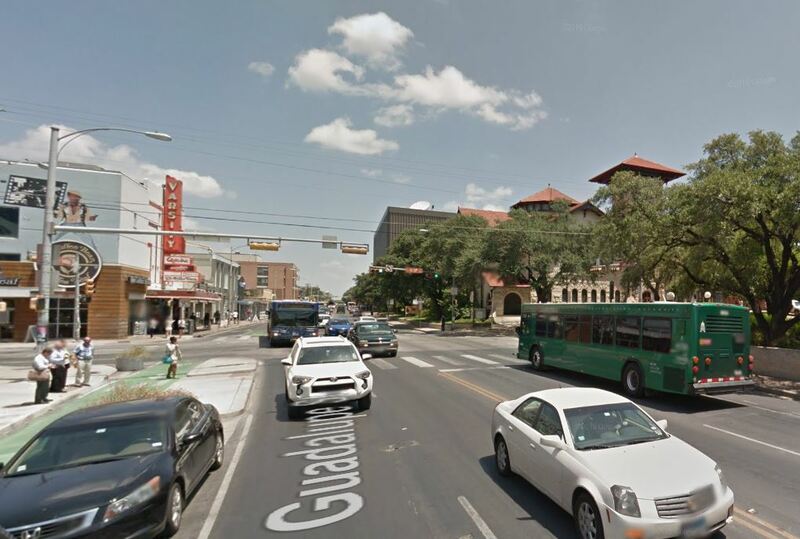 The Guadalupe-Lavaca transit lanes, for example, included repaving, plus bus stop relocation and upgrading. Parking meters were removed. And the project has resulted in effectively eliminating the possibility of dedicated LRT tracks on those sides of these streets (bus traffic too heavy). 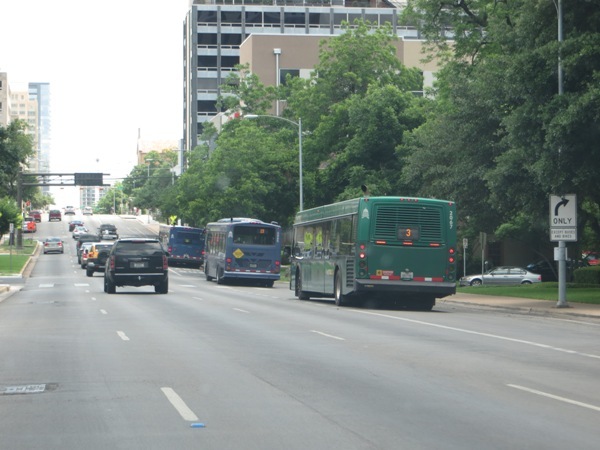 Buses use curbside reserved lanes on one-way Lavaca St. downtown. Curbside lanes on the Drag would be similar, but on two-way street. Photo: L. Henry. In previous discussions I’ve suggested that LRT dedicated lanes would need to be relocated on the opposite side of each street. Total cost of the downtown bus lane project was about $370,000 — not a billion-dollar investment, but enough of an investment certainly to give pause to totally redoing this project, or making substantial modifications to it (although modification to add LRT would definitely be a highly worthwhile investment). We also don’t know what COA and Capital Metro have in mind for the Drag project. Some community transit activists might be thinking very minimalist, but what are official planners thinking? • Configuration — The precise alignment on the transit lanes also needs serious consideration with respect to the needs of LRT (and evidence suggests that a substantial portion of the Austin community would like to see LRT as a project on the planning table now). Curbside lanes — as assumed in the CTR design, described above — are used by several major LRT systems (Portland, Houston, Dallas, and Denver come immediately to mind), but this configuration can often encounter serious problems, mainly with motor vehicle right-turns and especially pedestrian traffic (including where the right turns are made). Another problem for the Drag is the number of driveway cuts and the issue of access to businesses along this commercial alignment. Denver: Passengers waiting to board LRT train running in curbside lane on Stout St. Photo: Peter Ehrlich. To be sure, a number of different LRT alignment and configuration options are possible. My preferred alignment concept for the Drag has been to keep both LRT tracks on Guadalupe, in the center (with stations also in the center), and the outside (curb) lanes continued for mixed motor vehicle traffic, including buses. The main reason for this configuration is that buses need access to right-side loading at stops, and I envisioned that local routes like #1 would need to be continued. Of course, bus routes could be moved further west, probably to San Antonio-Nueces, but keeping them on Guadalupe would facilitate relatively easy transfers to and from LRT and bus. Ideally, the main Drag segment in this heavy-pedestrian/heavy-transit traffic area should be converted to a pedestrian-transit mall, with general motor vehicle traffic prohibited (except perhaps in the case of service vehicles for adjacent businesses). However, a design with reserved transit lanes plus a single mixed-traffic lane in each direction would appear to be possible. To sum up: While dedicated transit lanes, with very minimal investment, could possibly be helpful as a preparation for LRT, I’d recommend huge caution and vigilance as this notion moves forward. Keeping particularly in mind the considerations I’ve raised above. 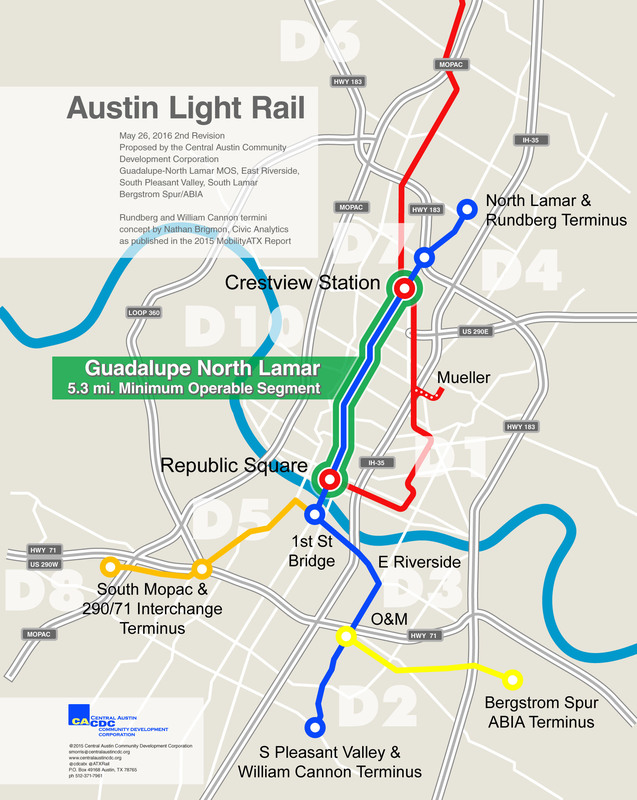 Plan Now for Light Rail in South Lamar! South Lamar corridor. 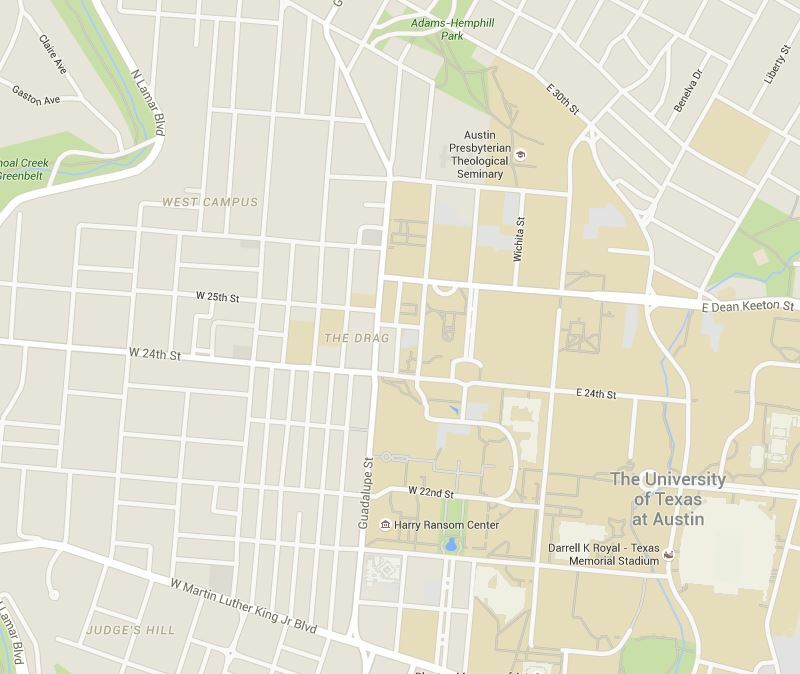 Map: City of Austin. 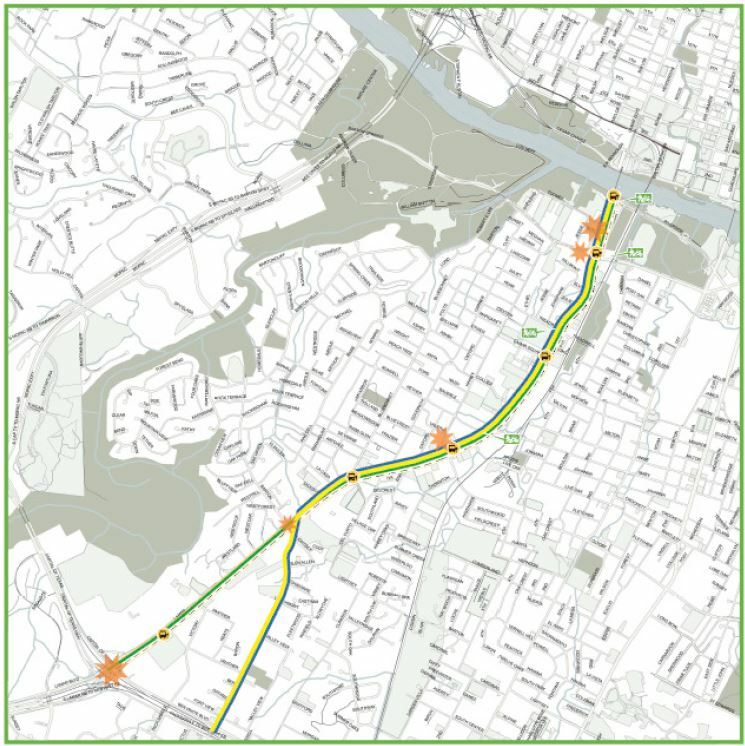 The following comments, adapted here to webpage format, were distributed to attendees at a public event sponsored by the City of Austin’s South Lamar Boulevard Corridor Study project on 10 December 2014. Lyndon Henry is a transportation planning consultant, a technical consultant to the Light Rail Now Project, and a contributing editor to Austin Rail Now. His comments highlight the vision of Austin Rail Now and other transit advocates that light rail is justified in, and needs to be planned for, a number of the Austin area’s major travel corridors. 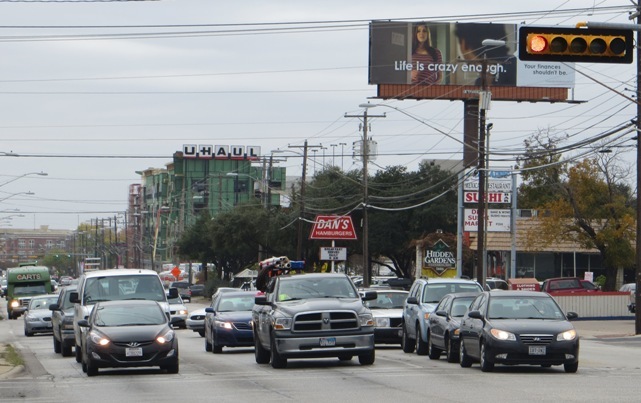 • In terms of both travel density and traffic congestion, South Lamar Blvd. ranks high among Austin’s major travel corridors (see Latest TTI data confirm — Guadalupe-Lamar is central local arterial corridor with heaviest travel). Current travel density plus rapidly increasing population density plus commercial growth in this corridor all indicate that planning for light rail transit (LRT) should long since have been under way. • A South Lamar surface LRT line, possibly using an alignment design such as is illustrated below, needs to be a major part of an eventual citywide system branching north, south, east, and west throughout our region from an initial central spine in the Guadalupe-North Lamar corridor. • The South Lamar Corridor Improvement Program should be reconfigured to include planning for LRT as a crucial focus of this project. 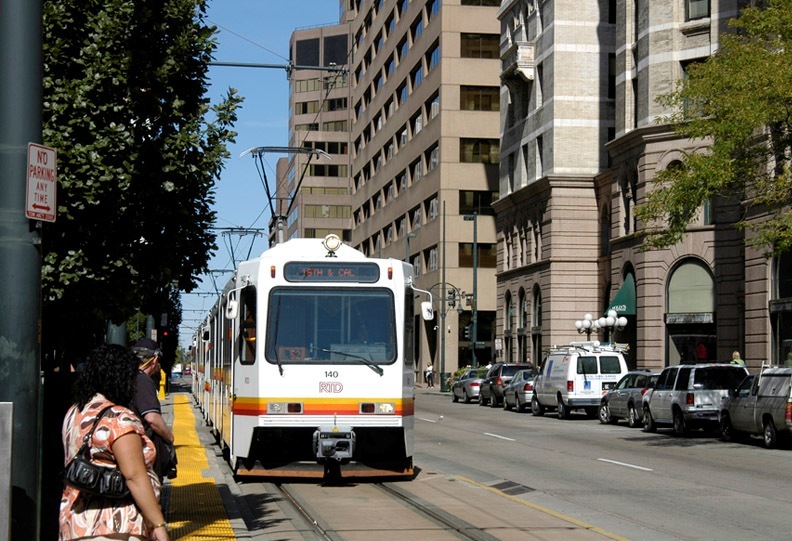 Planners and traffic engineers need to ensure that any “improvements” in this corridor facilitate dedicated transit lanes for future light rail, and certainly should not impose obstacles to it. It’s way past time to scrap the practice of proceeding with major projects with little if any thought to the future. • Planning should involve the Austin community as a whole, and this means forming a broad, inclusive community committee to oversee policy and technical decisions, including a comprehensive transit-focused mobility plan for Austin and its surrounding region. No more secretive project teams meeting in a virtual “bunker”, then emerging to tell us what they’ve decided for us! Authentic public participation means including representatives of neighborhood and other community groups, plus others with applicable expertise within the Austin community at large. Current view of traffic and urban development on South Lamar. Photo: Austin Mobility. Resume planning light rail in Guadalupe-Lamar! travel-density Guadalupe-Lamar corridor. Photo: Google Maps Streetview. The following comments, adapted here to webpage format, were distributed to a public event sponsored by the City of Austin’s Guadalupe Transportation Corridor Project on 3 December 2014. Lyndon Henry is a transportation planning consultant, a technical consultant to the Light Rail Now Project, and a contributing editor to this website. 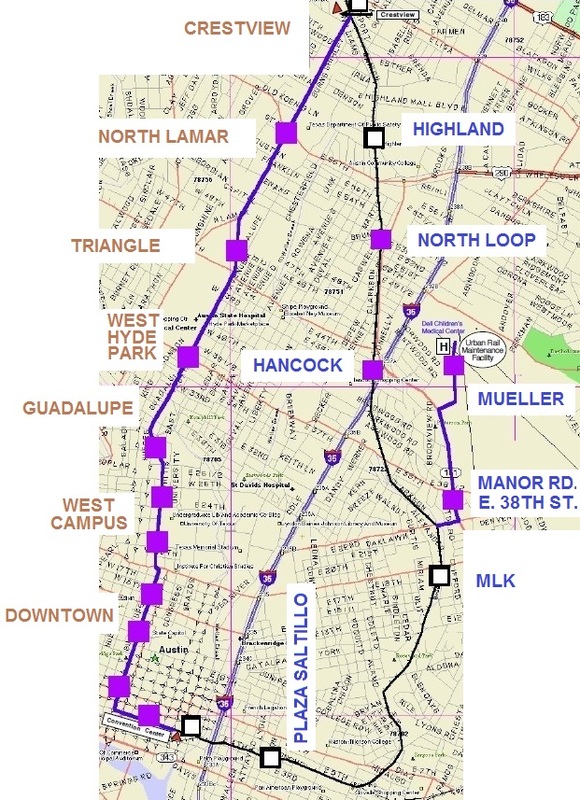 • A light rail transit (LRT) starter line for the Guadalupe-Lamar (G-L) corridor has been studied for 40 years, with at least $30 million invested. (Source: AustinRailNow.com) This is a plan that makes sense, and it’s time to move forward with it! • A surface starter line like the one shown at left (6.8 miles) could be installed for less than $600 million. With affordable, cost-effective design, this would become the central spine of an eventual citywide system branching north, south, east, and west throughout our region. 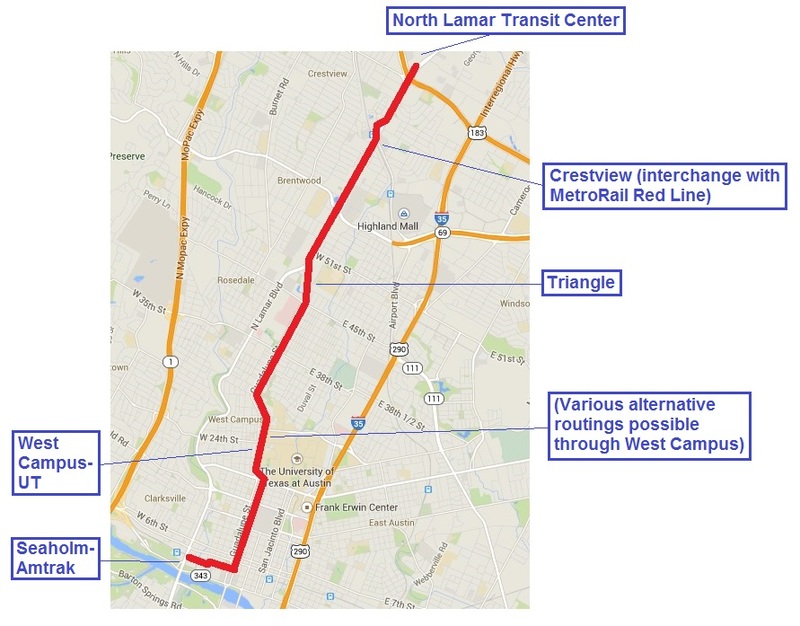 • The Guadalupe Transportation Corridor Project should be reconfigured to focus on development of this long-deferred LRT project, along with the $2.5 million of previous funding for the now-defunct Highland-Riverside urban rail plan, now held by Capital Metro. Re-purpose urban rail planning to focus on light rail transit for G-L! • Planning should involve the Austin community as a whole, and this means forming a broad, inclusive committee to oversee policy and technical decisions. No more secretive project teams meeting in a virtual “bunker”, then emerging to tell us what they’ve decided for us! Authentic public participation means including representatives of neighborhood and other community groups, plus others with applicable expertise within the Austin community at large. 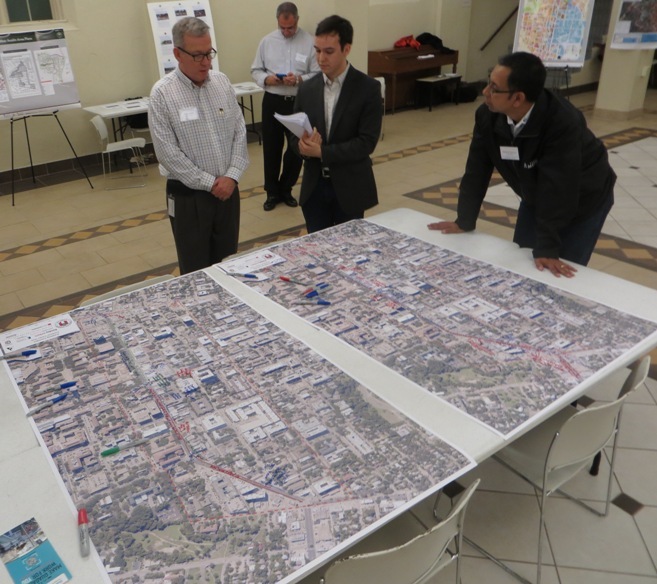 At Dec. 3rd Guadalupe Transportation Corridor Project public event, project manager Alan Hughes (center, in checkered shirt) discusses project issues over table with Drag corridor maps. At far right in photo is Roberto Gonzalez of Capital Metro’s Planning Department. Photo: L. Henry. 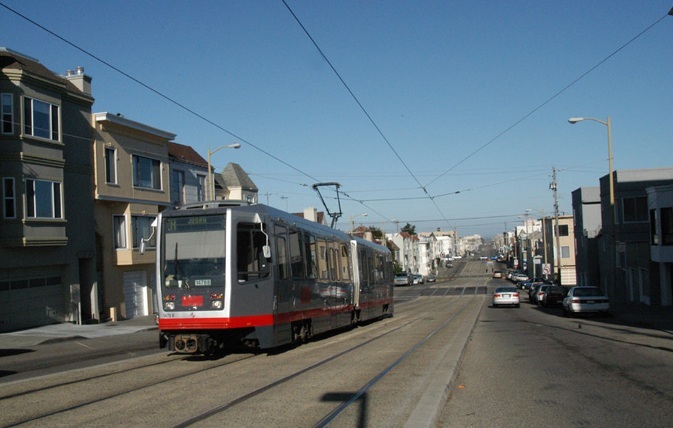 N-Judah Line Muni Metro light rail transit (LRT) train running in raised median on San Francisco’s Judah St. Alignment in this constricted 80-foot-wide arterial includes space for 2 dedicated light rail tracks, 4 vehicle lanes, and shared sidewalk for pedestrians and bicyclists. Similar alignment design could fit dedicated LRT tracks, 4 traffic lanes, and sidewalks into Austin’s Guadalupe-Lamar corridor. Photo (copyright) Eric Haas. In recent years, critics of installing “urban rail” — i.e., a light rail transit (LRT) line — in the Guadalupe-Lamar (G-L) corridor have endeavored to portray this potential project as an impossibly daunting task, contrary to many years of local planning to do just that. The predominant contention is that these two busy major arterials are simply too narrow to accommodate a double-track LRT alignment on dedicated lanes while maintaining adequate general traffic flow, and that introducing LRT would require either heavy civil works construction, or extensive, costly acquisition of adjacent property to widen the right-of-way (ROW), or both. However, the G-L travel corridor — most central in the city — actually carries the heaviest travel flow of local arterials, serves the highest-density neighborhoods; and connects the most important activity clusters; thus, ultimately, given the inherent constraints of motor vehicle transportation, some type of high-quality, high-capacity public transport alternative is essential to maintain long-term mobility. Fortunately, there are LRT alignment designs that would facilitate fitting affordable, cost-effective, surface LRT into these arterials, while maintaining at least four lanes of general traffic capacity through most of the corridor. While this corridor is characterized by an unusually narrow roadway structure — much of both North Lamar Blvd. and Guadalupe St. have total ROW (including sidewalks and curbs) just 80 feet wide — there appears to be adequate ROW width to install dedicated LRT lanes, within a 24-foot reservation, without additional ROW acquisition (easements), together with four traffic lanes (two 10-ft lanes per direction) for most of the alignment, plus sidewalks and curbs (8 fteet) on each side. North Lamar Blvd. has unusually narrow right-of-way width for heavily traveled central local arterial street. Conditions of Guadalupe St. are similar. Photo: L. Henry. For stations, relatively short segments of additional ROW would need to be acquired — approximately 20 feet of width for 300 feet (about one block) on each side of major intersections intended as station sites. Acquiring wider ROW would also be useful along sections of Guadalupe St. (particularly where the proposed LRT alignment runs adjacent to stretches of state-owned land). Within the Drag section of Guadalupe (W. 29th St. to MLK Blvd. ), dedicated LRT lanes could remain in the center of the arterial, with some reconfiguration of traffic lanes and other facilities. The following schematic diagram illustrates a cross-section of this design for the majority of both North Lamar and Guadalupe, with LRT running in a dedicated reservation, two traffic lanes on each side, and sidewalks shared by pedestrians and bicyclists on each side. 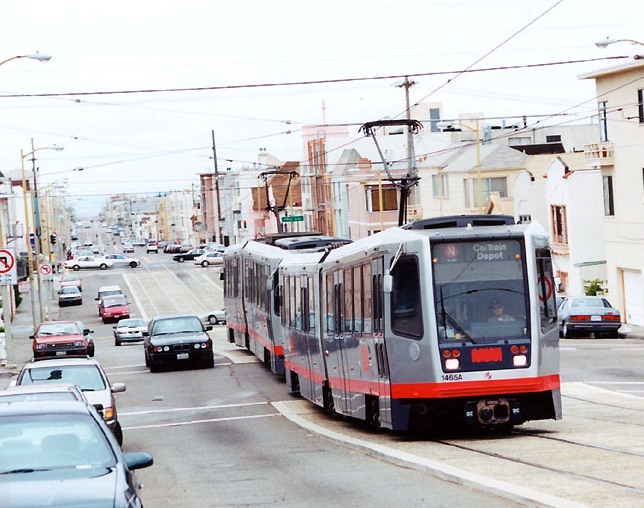 For such a configuration of an LRT reservation within a major arterial, constrained by narrow ROW width, San Francisco offers perhaps the closest operating example with the N-Judah Line of the Muni Metro LRT system that branches westward from the city center. For a roughly 10-block section along Judah St., from about 9th Avenue to 19th Avenue, LRT tracks are laid in a raised dedicated reservation that isolates them from motor vehicle traffic; eliminating the need for additional barriers such as channelization buttons or other separation devices, this design has the benefit of minimizing horizontal clearance. As the photo at the top of this post illustrates, despite a ROW constraint of just 80 feet, this configuration of the major Judah St. arterial is able to provide the raised LRT reservation plus 4 motor vehicle lanes plus parallel sidewalks. It should not be difficult to envision a similar design working in Austin’s Guadalupe-Lamar corridor. In the overhead view shown in the photo below, the top of a Muni Metro train can be seen in the center, running on the upper of the two tracks in the reservation. The different allocation of ROW space for traffic and sidewalk can be noticed — San Francisco provides an on-street parking lane and a traffic lane on each side of the arterial, plus sidewalks nearly 11 feet in width. In contrast, Austin Rail Now recommends that Guadalupe-Lamar would have 4 full traffic lanes of 10-ft width, no parking lanes, and 8-ft sidewalks. 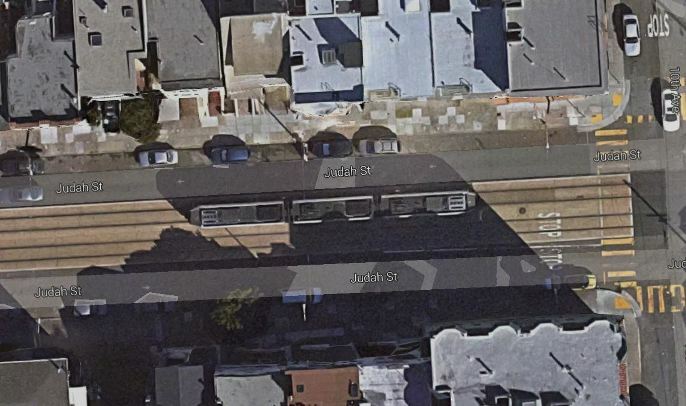 The following two photos at surface level showing Muni Metro trains in the Judah St. reservation further suggest how efficient LRT service can be installed in the relatively constrained arterial ROW of Austin’s Guadalupe-Lamar corridor. 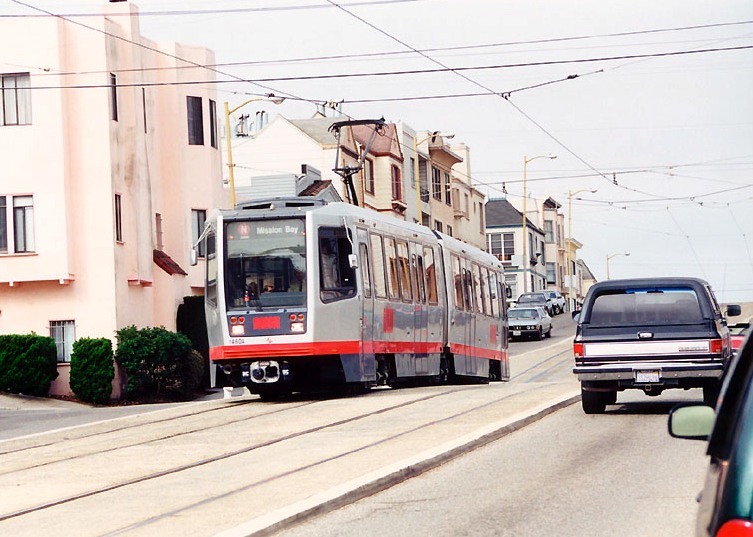 In this view of single-car train on slightly raised median near 16th Avenue, transverse spanwire that holds OCS power wire can be seen behind train, suspended between TES poles on either side of street. TES poles also serve as street light masts, a typical dual function. PHOTO: Peter Ehrlich. In this view of a train near 16th Avenue, the slightly raised center median reservation can be seen more clearly. Over the train, transverse spanwires holding OCS can be seen; other cross-wires are general utility cables. Photo (copyright) Eric Haas. MetroRapid bus, southbound on N. Lamar, nears Koenig Lane during testing on Dec. 10th. 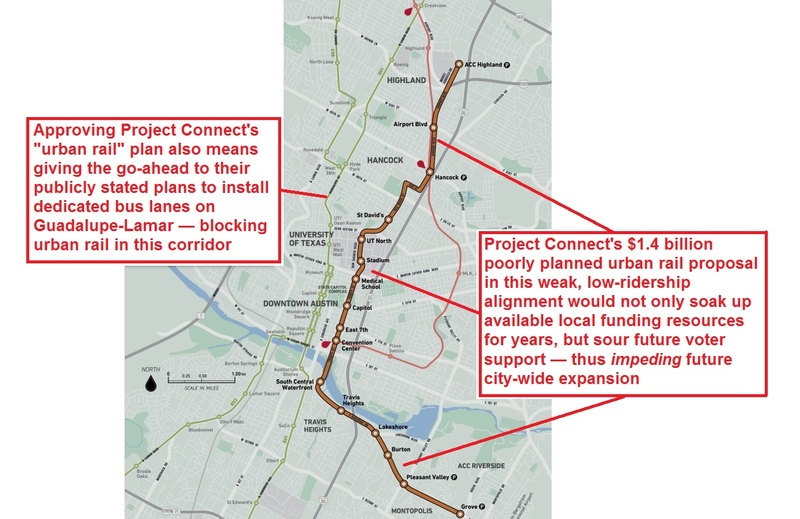 By dumping urban rail for this corridor, Project Connect would be free to proceed with plan to install specially paved bus lanes instead of rails. Photo: L. Henry. The Elephant in the Room within the Project Connect (COA) urban rail plan (first to Mueller via East Campus, etc. 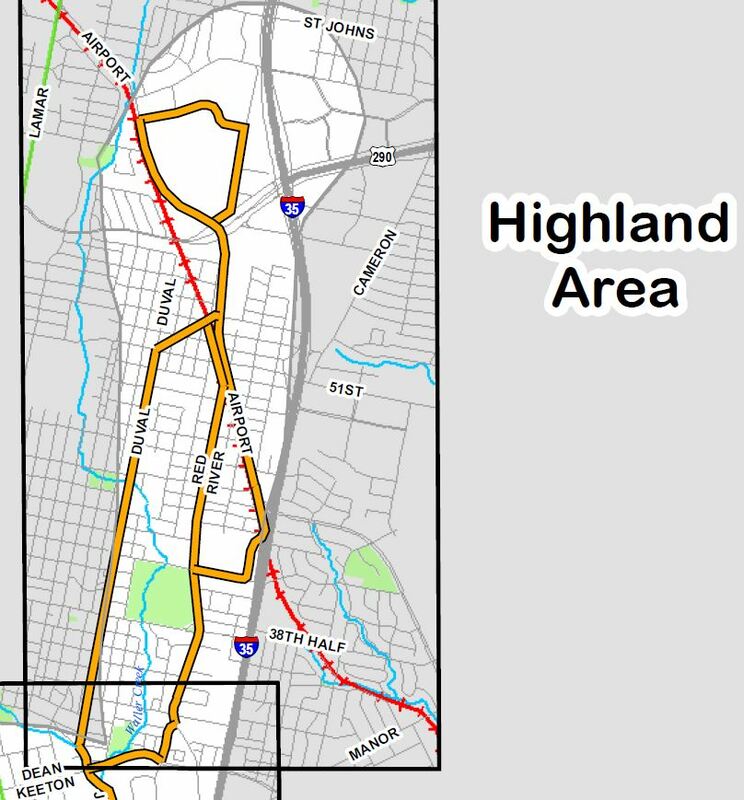 and then out the East Riverside Corridor) is the official proposal to build 40% to 50% dedicated bus lanes, roughly 15-18 miles, within the 37-mile MetroRapid system. This $500 million expenditure appears as a near-term (within 10 years) investment, 80% of which would come from the Federal Transit Administration. Lyndon Henry and I have documented this and explained how it might work in an October 18th article entitled No urban rail on Guadalupe-Lamar? Then get ready for bus lanes…. When I spoke with Project Connect’s Scott Gross about the nature of this a few weeks ago, he said that the dedicated bus lane plan was one that included both right-of-way acquisition and exclusive bus lanes. The math here says that these lanes would be far more extensive than paint-on-paving such as we are about to see on Guadalupe and Lavaca between MLK and Cesar Chavez, 1.4 miles at a cost of $370,000. This figure points to a heavy-duty reinforced concrete bus lane in each direction, 18 inches thick, similar to the bus pads at bus stops we see along major bus routes. This would require tearing up the street as severely as a light rail installation would, with all the other utility improvements therein that might be accomplished at the same time. While my cost-per-lane mile is a simple mathematical one, the result is consistent with what Ben Wear reports for building SH-130, 90 miles from Georgetown to Sequin, for $2.9 billion, or about $8 million a lane-mile. Construction costs in the middle of a very congested street, e.g., South Congress or North Lamar, would be significantly higher than a highway over farmland. That and ROW acquisition costs could easily account for $5.9 million dollars of difference. These bus lanes, planned in the next decade, would definitely be an obstacle to further FTA investment for 20 to 30 years wherever they are installed. The question we ought to be asking is: What kind of “high capacity transit” do we want on our heaviest-traveled streets? You are currently browsing the archives for the Transit priority lanes category.